Last night, in a matter of minutes, six people died at Trolley Square* and others were critically wounded. Grief and mourning belongs to those who lost their loved ones who were innocently shopping for Valentine’s Day, having birthday dinners, or just spending a night at the mall. True mourning also belongs to a Bosnian family, having come to this country to escape the horrors of being Muslims in the wrong place and time, and having lived a ravaged, horrific existence. They now are forced to struggle not only with the death of their child and brother, eighteen-year-old Sulejman Talovic, but must grapple with the inexplicable, incomprehensible concept that this “good boy” had become a mass murderer. And no one will ever know why. I suppose one could be relieved that this didn’t take place less than a month ago, during the Sundance Film Festival. I’ve been to Festival premieres at the theatre directly across the street from Trolley Square. I don’t know if the Festival uses those theatres any more, but if they do and that had been the timing, the Trolley Square area would have been filled with thousands of people rather than hundreds. Also, had this massacre been today and not yesterday, I’m sure that there would have been hundreds of additional last-minute Valentine’s Day shoppers on the scene. And I cannot help but think of all the myriad times I went to Trolley Square. I have fond recollections of almost every restaurant and store in the place. Those memories will never seem quite the same. Nevertheless, like the perspective I now have that makes my use of the word “mourning” in terms of my own “loss” seem flippant, I acknowledge that I cannot begin to comprehend what the employees and children and families and individuals who were THERE experienced. Those memories burned an indelible mark in each participant’s psyche, I’m certain. But it’s important to acknowledge that there were champions – heroes – there last night amidst the horror and turmoil. I am proud of the quick and appropriate response of the Salt Lake City Police. I am proud of the off-duty Ogden Police Officer who was having an early Valentine’s date with his pregnant wife, who, having assessed the situation, sent her to call 911 and tell others to “lock down” and then engaged and distracted the gunman and doubtless saved many lives. I am proud of store owners and employees who warned people – some risking their own lives in the process – to stay away from the shooter and those who sheltered frightened patrons in their storage rooms, bathrooms and even a freezer. I am proud of the first shooting victim, seriously wounded from being hit multiple times as he was leaving the mall, who ran back TOWARDS the shopping center in order to warn others not to come outside. If I am not mistaken, his selfless actions also prompted the first 911 call. These individuals claim that they did “what anyone else would have done in the same situation.” Even if that is the case, they are still heroes. Now I mourn for “my city” – not for myself, but for this senseless tragedy. I grieve, too, that it is a reality in LIFE that senseless tragedy can happen at any time and any place, bringing out the very worst in humanity but also the very best, as though Janus incarnate. I cannot presume to imagine how much they will be missed. *Read more about the shootings in any major paper. The largest Utah newspapers are The Salt Lake Tribune and the Deseret News. It is a sad matter about all the people that died because of this kids and i am glad that the kid died I am sorry for who all died. I can’t believe this happened just a few days after I was there – I know that might not make sense, but I guess it’s kind of like how you thought of the many times you have been to Trolley Square after you heard about it. I used to go there all the time when I lived in Sandy – it’s just weird to think about. Jeffrey Walker’s sister is in my in-law’s ward up here in Washington – he died shielding his son from the bullets. I cried so hard when I heard that because I know Tom and I would have done the same for Harper, yet it still makes you feel so helpless. I appreciate that you wrote about the boy’s family, and how hard it must be on them right now. It is sad to know that many people will take out their grief and anger on them. It really is very sad. On the same day a Provo high School student’s body was found in the river by and independence student walking from home. There were many other shootings that day too. One in a walmart in Idaho I think… I don’t remember the details of the others. It is just very sad sometimes what happens in this world of ours. 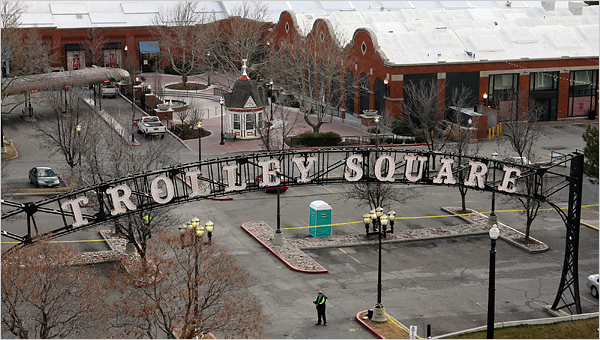 Flags in Utah will be flying half mast for those at trolly square. Sometimes horribly sad things happen. And sometimes the world doesn’t pay any attention until one of them does. It’s been quite a while since I HAVE been there (which had been just another part of the stupid resentment about missing “my city”). But what you said still makes complete sense to me. I know the very bench that Officer Hammond sat on to wait for his wife by Rodizio so well. We had so many big family celebrations there. I know those escalators and the “tiers” and how my family and my friends and I would “telelocate” throughout the mall. I shopped at Bath & Body Works many times. And Pottery Barn and Sharper Image and Restoration Hardware and Laura Ashley and so, so many others. We USUALLY parked in the west parking lot. We went to Dan’s cast parties for Pioneer Memorial Theatre at Green Street. We went to the Hard Rock. I loved the little florist shop there. I’ve eaten at Spaghetti Factory so many times over the years I couldn’t begin to count. Dan and I used to take Sarah and/or William there when we had them in Salt Lake for sleep-overs. I think we took Leif there, too. And I ate at Desert Edge Pub with so many different people (including my friends and their KIDS in the restaurant section). That brings up a whole other line of thinking (which was probably first in your mind): What a horror to have been there with CHILDREN. What a horror to have been there at all. I cannot say for certain how frozen I might have been in such a situation, but I know that my first instinct would have been to protect them. And in spite of…whatever, Dan would have protected Sarah or William or Leif or ME or any family or friends with his very life. I have no doubt. Though it’s still tragic and senseless and a great loss, when you said that Jeffrey Walker died trying to shield his son from the bullets, I couldn’t think of a more NOBLE way to die. As for Sulejman Talovic’s family, I feel horrible that there has been some anger and bigotry directed at the Bosnian and/or Muslim communities in Salt Lake City. They are mourning, too. And they are probably more baffled about what happened than anyone. Moreover, they must shoulder the guilt that a horrible crime was perpetrated by their loved one. They came to this country to escape horror and bloodshed, have led a peaceful existence, and now they are suffering loss and terror again. And they have the additional fear that they will once again become the targets of bigotry. I think everyone needs to remember that, as the Ambassador to the United States from Bosnia-Herzegovina, Madame Ambassador Bisera Turkovic, and so many others said tonight in a candlelight vigil honouring the victims and the heroes in this situation, this was the act of one sick individual, and everyone should come together as a community and be STRONGER because of this, not divided.